Elbow hygromas are extremely common in large breed dogs. These sores typically develop from repeated contact with hard surfaces such as concrete or hardwood floors. Because of their size, larger dogs tend to put more pressure on their elbows. Canine elbow protective sleeves created by DogLeggs™ are commonly used to treat elbow hygromas. Elbow hygromas are caused by excessive pressure to the elbow. These sores might also appear as the result of a bite or injury. Hygromas are common in dogs that are recovering from surgery or those that suffer from medical conditions that make them less active. An elbow hygromas is a dark, fluid filled pocket. These pressure sores are not painful and typically do not cause a problem for dogs that are affected. Occasionally, hygromas become infected. The infected fluid inside a hygroma can spread throughout the body if not properly treated. Hygromas that are painful or warm to the touch should be seen by a veterinarian. The first step of treatment is to prevent further injury to the area. It’s important to provide a soft bed with plenty of padding. The elbow needs adequate protection as well. Regular bandages do not provide enough padding to protect the elbow from pressure and often slip off or move around. Standard Length DogLeggs™ provide superior coverage, padding and protection of the elbow joint and their unique design keeps them in place. This revolutionary product is an excellent alternative to traditional bandages. DogLeggs™ can help treat elbow hygromas and eliminate the risk of complications associated with drainage and surgery. A foam donut can be inserted in DogLeggs™ to provide additional protection. Standard Adjustable DogLeggs™ are easy to apply, comfortable and machine washable. They are custom made to ensure the perfect fit. DogLeggs™ products can be used to protect and treat a variety of conditions. Standard Adjustable DogLeggs™ are commonly used for the treatment of elbow hygromas. Our products are recommended by veterinarians. 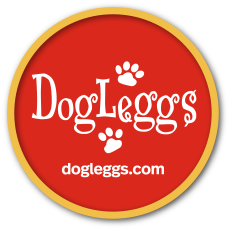 Please contact us for more information about DogLeggs™.